Recently, Jeramy Hale Sensei was teaching at the dojo. He brought up a point which I thought was so important that I decided to make a video about it. Jeramy Sensei was making the point that your aikido training partner is not your pretend enemy. Here’s the video. I hope you enjoy. I look forward to seeing your comments. Hi, everyone. My name is Frank Bloksberg. 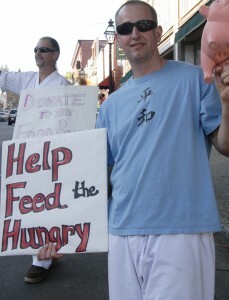 I am Chief Instructor of Aikido’Ka, an aikido dojo in Grass Valley, California. My good friend Jeramy Hale taught at the dojo on a recent Friday evening, and said something so important and profound that I feel compelled to discuss it with you. Jeramy was talking about the relationship between the people training. Jeramy explained that even though your partner is playing the role of an attacker, that person is not your pretend enemy. Let me say this again because it’s so incredibly important. Even though your training partner is playing the role of attacker, that person is not your pretend enemy. I’ll explain why Jeramy’s point is so important. Here’s a quote from an article about the self-defense value of a particular form of karate. “When we train, we’re as serious as we would be during a life-and-death struggle. Our mindset throughout each session is that we’re really defending ourselves. We’re conditioning our minds to see our attackers and to fight them with every move we make.” In other words, see the people you’re training with as your enemy and treat them that way. After years of this type of practice, how do you think you’ll respond to any type of a threat, whether physical or emotional? I agree that it’s absolutely true that training should create fast, precise movement. If you have to think about how to respond to a physical attack, then chances are your response will be too late. But if year after year you practice a violent response to attacks, then that’s how you’ll respond to any perceived attack – without any thought and lightning quick. Indeed, that’s the point. The self-defense aspects of Aikido are about resolving disputes, even potentially violent disputes, with no one getting hurt. With Aikido, we look to blend with our attacker. We use evasive movements to unravel the attack and place the attacker in an untenable position. We practice these movements until we can precisely perform them without thought and lightning quick. So if you do perceive an attack, you will not automatically respond with violence. And that’s the point. Aikido, as with every other real, modern martial art is not a combat system. Aikido is primarily about self-improvement and relationship building. While Aikido practice can build incredibly effective self-defense skills, it’s primarily an art. Practicing Aikido can make you a much happier, healthier member of an incredibly fun community. Practicing a true combat system will make you a better fighter and get you beat up a lot, likely nothing more. You get to choose which one of these you want from your life. You know which one I choose. You bring the attack in such a way so that your training partner can do his or her technique perfectly. Likewise, you perform your defensive techniques so that the attacker can receive the technique perfectly. We’re people, so we don’t do anything perfectly. Nonetheless, that’s the goal. We practice to support each other’s improvement. We’re not pretending to be enemies. We’re partners in our practice, and working together for mutual self-improvement and to learn whatever the thing is that we’re working on. Whenever human beings understand something, we automatically believe it. You don’t have a choice. The belief happens automatically. Once you understand something, you may be able to override the belief. But many beliefs continue even after the belief has been thoroughly debunked. The scientific literature is filled with studies about this. If we pretend to be each other’s enemies, then we actually are enemies at least for some time. We then have to somehow override that belief. Consider for a moment what pretending to be enemies can bring up in your mind. Bringing an attack as an enemy involves trying to hurt your enemy. It brings up the desire to defeat, even humiliate one’s enemy. We destroy trust and community by doing so. In no way is this appropriate for Aikido practice. Aikido exists to improve our lives and our relationships. Not surprisingly then, creating enemies has absolutely no place in the dojo – not even pretending and not even for a short time. Now don’t get the wrong idea. Aikido is martially effective. Depending on your practice, it can be extremely effective. You can train as vigorously and powerfully as you want. You will get there with respect and by building trust with your training partners. The dojo is a safe place for everyone who trains here. If you and I are training together, you have to feel safe. If you don’t feel safe, then I have work to do to get you there, and being your enemy sure isn’t going to accomplish that. So thank you, Jeramy. If Aikido training sounds good to you, then please check us out at JoinAikido.com, and thank you so very much for your time. Start your 30 days free aikido training by filling out the form below. I look forward to training with you! 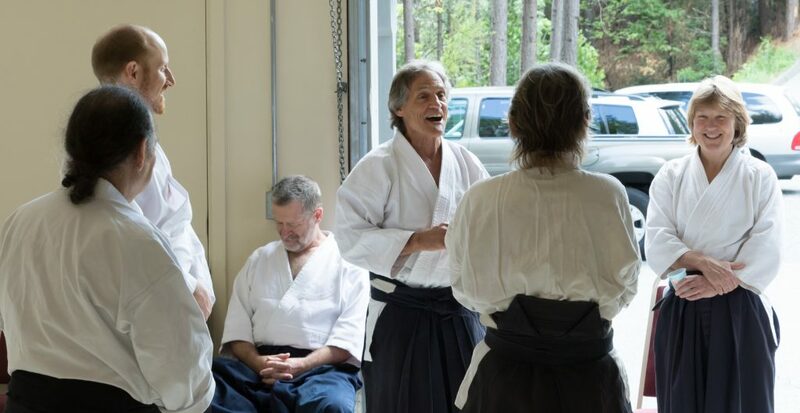 Mary is an absolutely wonderful person who drives 50 minutes each way to train in Grass Valley at Aikido’Ka. We’re told all the time that the community at Aikido’Ka is like a fun family — accepting, kind and supportive. And tons of fun. That marvelous, welcoming feeling people get from training here stems from our diligent attention to treating everyone with the utmost respect. I don’t mean a stuffy kind of respect. I mean a truly supportive, embracing learning from our mistakes, relationship. The real value in martial arts training is not from knowing how to fend off an attacker — traditional self-defense. The real value in practicing aikido with us is that we learn how to treat people in ways that improve our relationships day-to-day. Yes, you want to know how to defend yourself. And, you’ll learn that at Aikido’Ka. While a violent attack really may happen, it’s unlikely. But you will interact with people every, single day. And every day you will use the relationship skills you learn training here. Oh, and it’s fun! Just ask Mary. We’re starting a new program at the dojo that I’m calling Hero’s Journey. Since Hero’s Journey is at its beginning stages, it’s not fully put together. But here’s basically what it is: Heroe’s Journey is an intensive 1-year long program to change your life for the better. We all know that we have the potential to live a heroic life and do amazing things. It’s time to start! We have to decide to actually pursue our heroic dreams, organize and dedicate ourselves to living a heroic life. That’s what Hero’s Journey is. Goal setting, organizing, doing. And lots of accountability, aikido training, fitness and community service. You’ll be seeing in our blog members of Hero’s Journey telling about their experiences, challenges and accomplishments. Dr. Gideon Haimovitz is one of the first members of Hero’s Journey. He runs Grass Valley Chiropractic. Gideon’s very serious: He’s training in almost all of our classes, both aikido and kettlebells, and he’s helping with many of the youth classes. He’s also traveling to seminars to improve his aikido. Gideon will be commenting to this post about some of his experiences so far and what he’s working to accomplish.